An all-black ensemble is a wardrobe staple for me during winter as it’s guaranteed to always look polished and is in keeping with the moody hues of the season. A no-brainer, right? However due to this reason you can almost guarantee to find yourself amongst a sea of black outfits. The key is making your outfit stand apart. It’s all about finding the centrepiece to your overall look, something that you can build the rest of your outfit around. To do this I find it pays to find a garment with an eye-catching feature that makes it a statement piece that will help you to stand out in the crowd. I spotted this Roksanda Truffaut Bell-Sleeve Top from Farfetch and I knew immediately that it fit the bill. It’s sleek but the sleeves simultaneously give it an avant-garde feel and adds a bit of drama to my outfit. 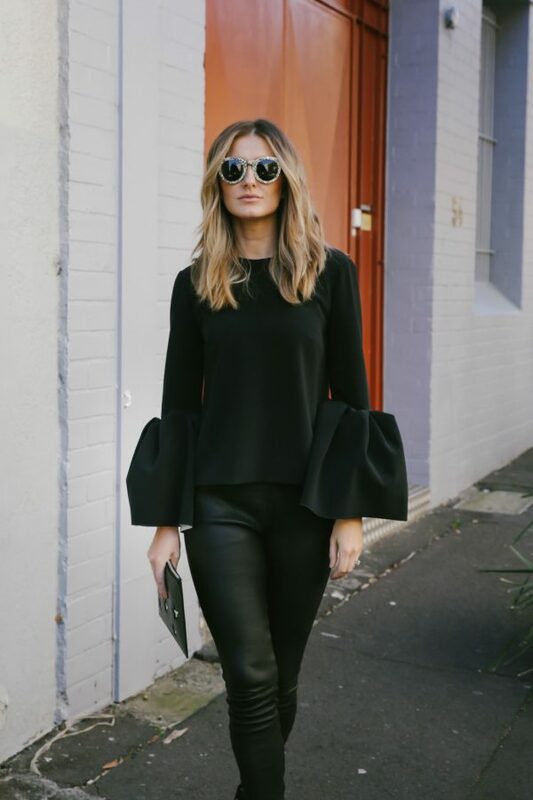 A statement top with bold details needs to be worked back with a piece with clean lines so as not to overwhelm so I opted to pair it with my favourite LXÉ leather pants. I wanted to keep my entire look all the same colour while adding the right accoutrements to keep it from looking too heavy and dark. For this reason I added accessories with interesting finishing touches in order to add some punch to my get-up. My Saint Laurent Monogram M3 sunglasses are the ultimate in statement eyewear with their gold glitter detail and is the ideal complementary piece to a head-to-toe black look by providing a small pop of colour. 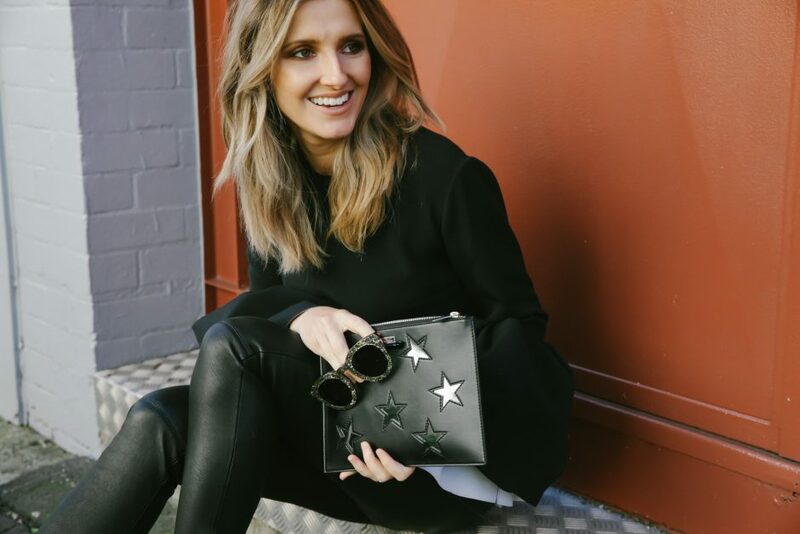 I’ve always been a big fan of all things monochrome so my Stella McCartney embroidered star clutch is the ideal bag to carry all my essentials for the day. In keeping with the minimalist nature of my outfit I opted for mini lightning bolt Astley Clarke stud earrings which add a playful touch to my attire while remaining understated. Heels are a must with the dressy nature of this ensemble so my Alaïa studded heels were the perfect way to finish off the look . Wearing black is my winter go-to (as I’m sure it is for a lot of people) but there’s no need for it to be boring—it’s all in the attention to detail and the right finishing touches.